The Delta Foundations Single-Handle Kitchen Faucet in Chrome gives you a practical and hardworking solution that was designed to last a lifetime. With the single-control lever, you can easily adjust both the water flow and temperature. With an elegant, high arc spout that swivels 360 0s, you have flexibility and greater reach in rinsing food, dishes and the sink. Delta's exclusive DIAMOND Seal<sup></sup> Technology uses a valve with a tough diamond coating. InnoFlex<sup></sup> PEX waterways keep water inside the faucet out of contact with potential metal contaminants. This powerful combination brings you a faucet built to last up to five million uses. Only Delta faucets are equipped with Touch-Clean<sup></sup> soft, rubber nubbins that allow you to easily wipe away calcium and lime build-up with the touch of a finger. Foundations Single-Handle Standard Kitchen Faucet in Chrome The Delta Foundations Single-Handle Kitchen Faucet in Chrome gives you a practical and hardworking solution that was designed to last a lifetime. With the single-control lever, you can easily adjust both the water flow and temperature. With an elegant, high arc spout that swivels 360 0s, you have flexibility and greater reach in rinsing food, dishes and the sink. 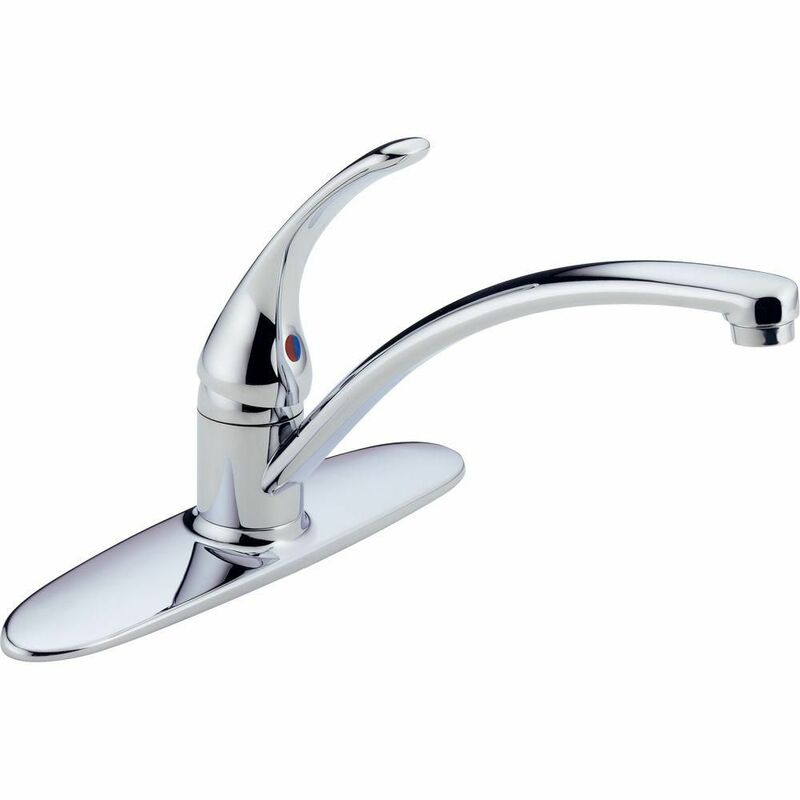 Foundations Single-Handle Standard Kitchen Faucet in Chrome is rated 4.2 out of 5 by 459. Rated 5 out of 5 by ILike2Fix from My plumber installed the faucet. I love it. My plumber installed the faucet. I love it. Rated 3 out of 5 by Tom from Base plate is smaller than previous Delta faucet and barely... Base plate is smaller than previous Delta faucet and barely covers the holes, is hard to align. Rated 2 out of 5 by Greg from Noisy the water flowing is usually making a ringing sound, difficult to adjust the handle for a b... Noisy the water flowing is usually making a ringing sound, difficult to adjust the handle for a balanced water temperature it's either very hot or cold, and the plastic nuts for mounting to the sink are to small you will need very large metal washers to secure it. Is this a ceramic disc type fawcett?